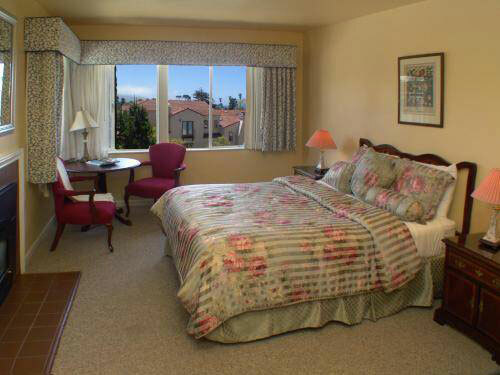 The Wayfarer Inn has traditionally been one of the most affordable hotels in Carmel. This makes it a good fit for Carmel visitors who are trying to keep their lodging costs down. Another reason to consider the Wayfarer Inn is its suites. They are some of the largest suites in Carmel. Other attributes of this hotel include beautiful gardens, dedication to customer service, and free internet access. At the Wayfarer Inn, guests are treated to complimentary breakfasts, free wine and cheese sessions in the afternoon, and free coffee and tea. In other words, the free perks are numerous. In the rooms, LCD televisions, fridges, and premium bedding figure among the standard amenities. Should a romantic escape be the aim, you can hope to secure a suite with a fireplace and ocean views. Groups who are planning special events can interest themselves in the hotel’s general facilities, which include a private garden courtyard with a brick fireplace that can make for an excellent meeting venue.